You’ve caught the fish of a lifetime. 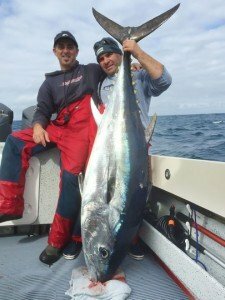 A huge, Southern bluefin tuna (Thunnus maccoyii), weighing over 100kg. It smashed the lure only a few metres from the boat and took over 200 metres of line in its first, blistering run. You’ve dreamed about this moment for a long time. It’s hard work and your arms feel like dropping of but finally you have the superb fish in the boat. Looking at it lying there, you let your thoughts savour the many meals you’ll have with your family and friends, recounting the epic battle many, many times! That evening, as you begin filleting the “barrel”, the euphoria wanes as you notice that instead of the glistening, translucent redness you were expecting, parts of the muscle appear much paler than normal. While some of the muscle is still a deep red, your knife cuts through flesh that looks green. The fight was hard and tough and you cannot imagine the fish had a disease, but the muscle looks terrible. Over half of the superb tuna you caught that day and had already promised many of your friends is looking inedible. The tuna did not have a disease, at least not an infectious disease. It was affected by what is scientifically described as “exertional rhabdomyolysis” and more colloquially called “burnt tuna”. The Japanese name for it is “yake-niku” which translated means “spontaneously done meat”. Fortunately, most recreational fishers have never seen such a dramatic example of this condition as shown in these photos, but it is well known to commercial fishers targeting bigger tuna. 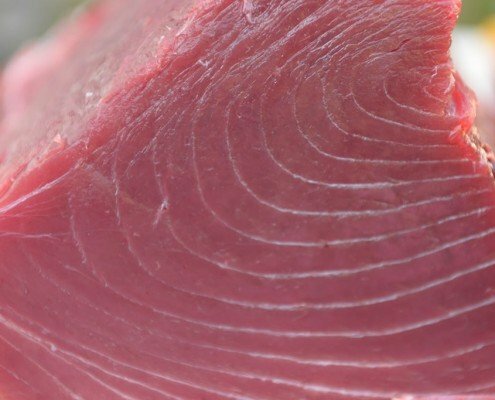 Studies have estimated that up to 25% of yellowfin tuna (Thunnus albarares) caught commercially by handliners off Hawaii and around 20% of Southern Bluefin tuna commercially caught off New Zealand were affected to some extent by this condition. The condition develops during the capture of the fish and continues after it dies. 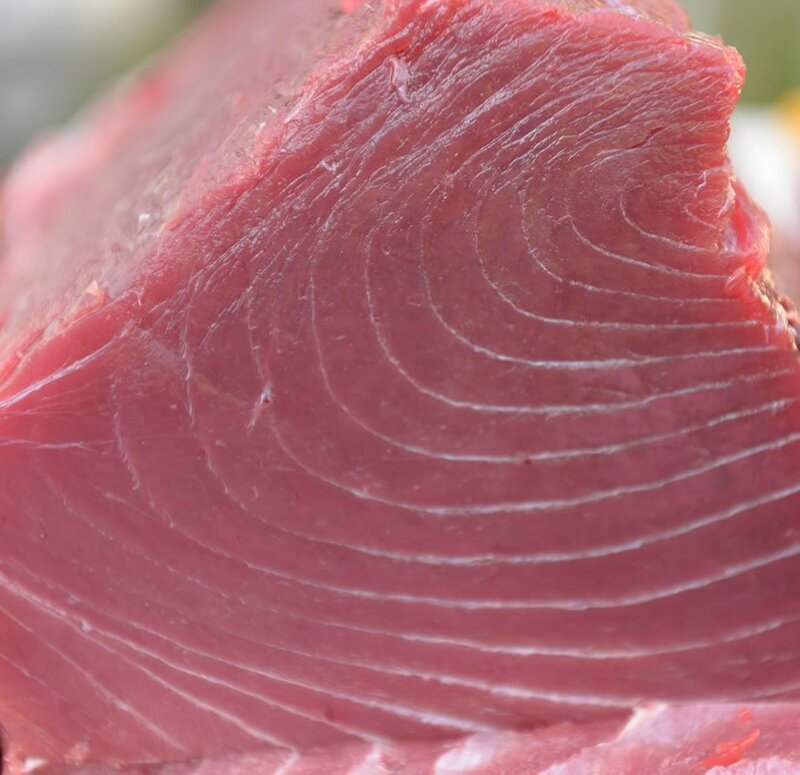 The stress of capture, reduced oxygen to the muscle and changes in other metabolic processes leads to an accelerated deterioration and degeneration of the tuna’s muscle fibres. While it looks unappealing, it can be eaten; however, affected muscle generally has a sour taste and is considered of very poor quality. 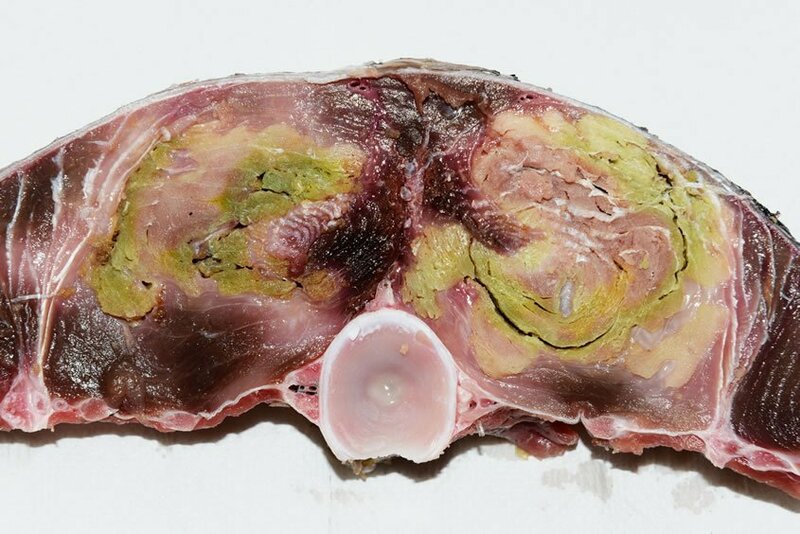 An example og ‘burnt’ tuna flash – as discovered in the 106kg southern bluefin tuna 10 hours after it was boated in cool conditions off South Australia. This is how tuna flesh should look when the fish has been brain spiked, bled, cored and then quickly chilled in an ice slurry. The photos shown here are of a 106kg Southern Bluefin tuna that was caught recreationally in April 2015 off Port MacDonnell, South Australia. Around half its muscle was severely affected. Microscopically the affected muscle was confirmed as having exertional rhabdomyolysis, or being “burnt”. While there is no doubt that the stress of capture is involved with the development of the condition, there is still some debate about the exact processes occurring within the fish that cause such rapid deterioration in the muscle. Some tuna may also be more prone to being affected – one study found that female fish were more commonly affected than male fish, as are fish with low energy reserves (for example, just after undergoing a long distance migration). 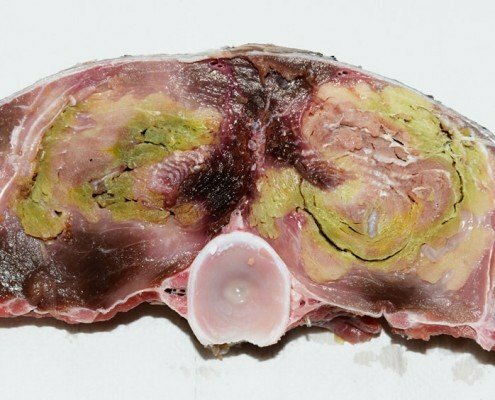 Interestingly, a similar condition has been reported overseas in yellowtail, Seriola quinqueradiata, which is related to the yellowtail kingfish we have here. Immediately kill the fish when you get it on the boat, by spiking or stunning it and then bleeding. Always bleed the fish after spiking or stunning. Insert a wire, fibreglass rod or heavy monofilament down the spinal cord of the fish. This can be inserted through the hole made in the skull by the spike, or by a coring device. This technique takes some practice but helps to stop any muscle activity that may still go on even though the fish is brain dead. Cool the fish as quickly as possible by removing the gills and gut and getting the whole fish into an ice slurry, which is much more effective than ice. Watch out for more details on these techniques and other ways to look after the fish you catch in upcoming articles. 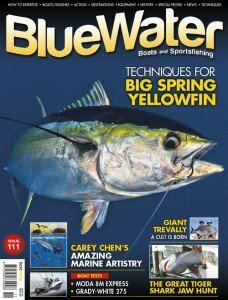 BlueWater Article – Burt Tuna and how to prevent it.